On the whole, credit unions are well known for taking care of not only their members, but their employees, too. There are all sorts of reasons for that, of course, with one of them being that employees who are taken care of are more likely, in turn, to take care of a CU’s members. As strange as it may sound, the concern your average credit union leader feels for the organization’s staff members sometimes gets in the way of them doing things that will, in the end, improve the lives of those same employees. A particularly noteworthy case in point: mergers and collaborative partnerships. After all, one of the main areas of concern (and also one of the main points of contention) for CU executives and board members while contemplating mergers and other such partnerships is employee welfare. The fact is, though, that mergers are likely to help credit unions–small and medium ones, especially–protect their staffers’ jobs while also offering them greater career, education and training opportunities as well as better compensation. That’s an important consideration given that while the movement, in general, has expanded its employment and compensation offerings over the last five or so years, there’s still a sizable number of CUs that have experienced the opposite–staff reduction and stagnant pay–in the same period of time. Before we talk further about why mergers could help credit unions in the latter category turn things around, let’s first look at what has been causing their downward compensation and employment trends. 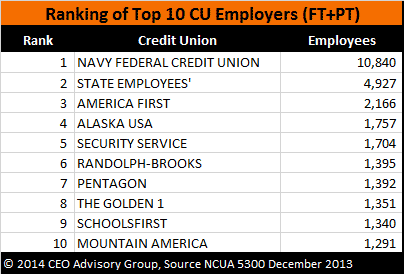 Let’s start with the staffing contraction that has impacted credit unions in general over the last five years–a contraction that can be blamed, in large part, on industry-wide profitability pressures. 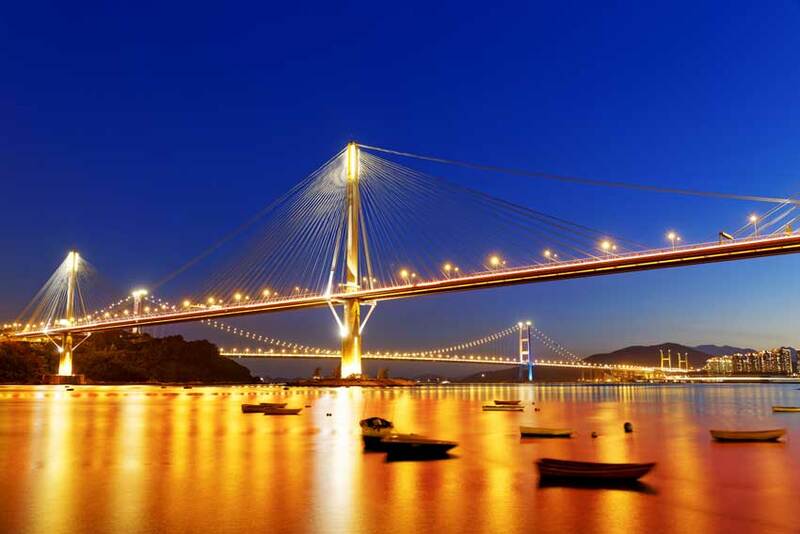 For example, a third of all credit unions (33 percent) reported a reduction in their FTE count during this time, while another third reported no growth at all for the same period. That means two-thirds of of the industry failed to grow at all between 2008 and 2013, for those of you keeping score. All of the above have been especially troublesome for small credit unions, as those with less than $50 million in assets lost nearly 900 employees between 2008 and 2013. A different, but no more positive, perspective on the same trend: less than a quarter (23 percent) of credit unions with assets below the $50-million threshold reported a growth in employment during that period. In contrast, 79 percent of CUs with more than $500 million in assets increased staff. The latter’s likely responsible for the 11 percent in employment growth–which translates to about 25,000 additional jobs–the credit union industry experienced from 2008 to 2013, by the way. After all, CUs with over $500 million in assets currently account for well over half (56 percent) of all employees within the movement. Well over a quarter of a million (270,000) people are now employed by credit unions across the United States–which compares favorably with staff levels at some of the country’s largest banks. For instance, Bank of America, Citigroup and Chase currently have 245,000, 251,000 and 261,000 employees, respectively, according to Wikipedia. Compensation within the CU space was similarly stagnant during the five-year period that ended in 2013. That’s not immediately apparent when reviewing the high-level stats related to credit union salaries, mind you. A case in point: total compensation for the industry grew by $3.7 billion, or nearly 30 percent, in the aforementioned period to nearly $17 billion. 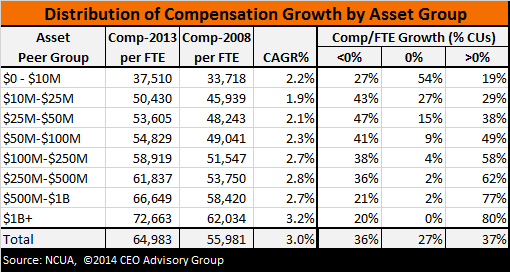 Some of this compensation growth, however, was driven by increased costs related to healthcare premiums. According to Kaiser Family Foundation Employer Health Benefits Survey, healthcare premiums far exceeded the inflation rate between 2008 and 2013, with family healthcare premiums growing at an annualized rate of 5.2 percent. Additionally, according to this same survey, today’s employees are being asked to carry a greater share of healthcare premiums than they were in the past. Employee contributions for both single and family coverage have been growing at 6.7 percent and 6.4 percent, respectively. Consider the impact an average healthcare premium of $5,900 for a single person or $16,350 for a family has on credit union compensation strategy. For a small CU, this represents a significant portion of the organization’s total compensation. As a result, these credit unions must compromise raises, retirement contributions, richness of health plans and/or employee contributions to these plans. Despite the growing costs, only a third (37 percent) of all CUs reported an increased compensation per FTE. More specifically, although nearly 80 percent of credit unions over $500 million in assets reported increased compensation per FTE, only a quarter (26 percent) of those with less than $50 million reported increased compensation per FTE. All of which is to say that not only have smaller credit unions been forced to reduce their workforce in recent years, but many also have been unable to keep compensation level with inflation during that time. As an industry, credit unions are now major employers that have shown consistent job growth over time. 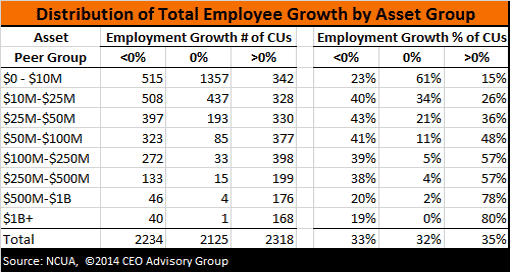 Dig into the numbers associated with that growth, though, and you’ll find that this also is a story of the haves and have nots–as in, large organizations regularly are adding staff and average compensation, while smaller CU employment is regressing and average compensation is stagnant. Mergers very well could help credit unions in the latter category–and those in the former category, too, in fact–turn things around, thanks to their ability to expand employment, improve salaries and benefits and enhance training, career progression and promotional opportunities.